This is actually quite quick to make – using a processor will speed things up even more. The real effort is in buying ingredients. Turmeric makes this curry yellow. It is not fiercely hot, and very flavourful and makes a good change from green and red curries. Prawns help give the dish a touch of the tropics, but you can use chunky/firm fish such as cod, tilapia, monk fish or even as one of my cookbooks has it, mackerel steaks. And of course you could use chicken instead of fish. Whole raw prawns in their shells have the advantage of the heads and shells contributing to a quick stock. It’s best to go to an Oriental grocer for these ingredients – it cheaper too. A suitable processor can be used instead of the pestle and mortar. Soak the chillies and tamarind. Cut off the top part of the chilli (where the stem was attached), remove the seeds and any significant dried membranes. Put the chillies in a bowl of hot water. Put the tamarind pulp in a bowl with 100ml hot water and leave to soak. Prepare the prawns and make a stock. Shell the prawns (leave the tail for effect) and put the shell and heads in a colander. Make a shallow cut down the back of the prawns with a sharp knife. Remove the intestine tract and put the prawn in a dish. Wash the heads and shells and put them into a pan with the stock and the water and bring to a simmer and gook gently for 15 minutes. Make the curry paste. Drain and chop the chillies, peel the outer leaves of the lemon grass and chop into small pieces, peel and chop the garlic, ginger, and turmeric. Add all the chopped ingredients with the pinch of salt to a mortar, and pound with a pestle until it is a smooth paste. Strain the tamarind pulp from its seeds and add to the paste with the shrimp paste. Pound until smooth and put into a separate dish. Make the curry. Chop the shallots in to a dice and fry for 10 minutes in a large pan or wok with a good glug of vegetable oil. Now, make a call on the paste – it’s strong stuff. There is sufficient here to use half for a mild tasting curry (though still with heat) – the other half can be kept in the fridge for a week or put in the freezer. For now add half the paste to the onions and fry gently for 3-5 minutes, strain the stock and add to the pan. If possible store the tin of coconut milk for a day or so then open the tin and using a knife break through the edge of the solid white cream to access the clear coconut milk below – pour (as far as possible) the clear milk into the pan, leaving the cream in the tin. Add the sugar and bring to a simmer and cook for 5 minutes. Now taste and add more curry paste if desired. Wash and chop the long beans, rinse and slice the bamboo shoots – or leave as they are if already sliced in a tin. Add the beans and bamboo to the pan and cook for 10 minutes. 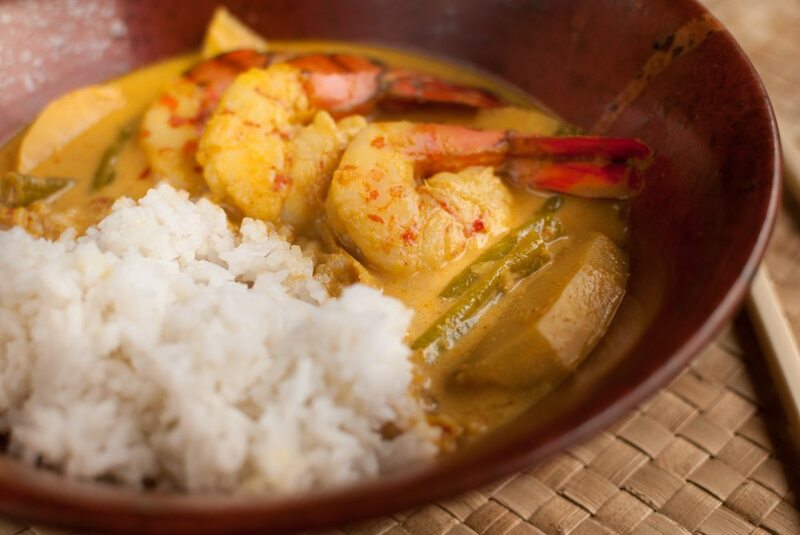 Add a tablespoon of the nam plah, the prawns and simmer for 5 minutes, then add the coconut cream and bring gently back up to heat for serving. Taste and season to adjust the hot, sour, sweet and salt (taking into account it will be served with lime). Serve the curry. Garnish with fresh chopped coriander and half a lime. Plain jasmine rice is perfect accompaniment. Perhaps a simple side of broccoli or choi sum would be welcome.